Screenplay, cinematography, phenomenal ensemble and 90's production design. F.H. Batacan’s award-winning Filipino murder mystery comes into big screen, helmed by Raya Martin hits the screens next month. The celebrated adaptation of the novel boasts an ensemble filled with seasoned actors and actress with Noni Buencamino and Sid Lucero led the cast brought the Batacan’s complex characters to life. 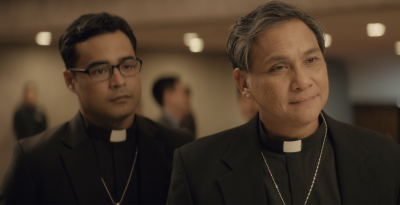 Set in 1997, the film follows two Jesuit priests, Saenz and Lucero solving a murder of young boys at the Payatas slums taking them to the scanty landscapes of Manila. To say the that the film is compelling is an understatement, every minute savors rich filmmaking tells a story, providing layers of eeriness, pulp and grit in 1990s Manila from Moira Lang and Ria Limjap’s meticulously layered screenplay; the story flows patiently, following the clues, testimonies red herrings that slowly build a jigsaw puzzle that comes as concrete and at the same time there is that ambiguous nuance in between which makes the script work because its structured like an investigative piece. Saenz and Lucero are real as much individuals and thankfully, the filmmakers and the actors managed to avoid your stereotypical do-good priests, throwing in some wisecracking words, these priests were portrayed having a faith that is genuine, cynic and grounded and relatable in a sense that they are portrayed as empathic, setting aside the religious image and interacting with other characters in a more genuine way. The set pieces takes you back in 1997, the pagers, bulky computers, trippy Windows 97 screensavers, and ring telephone were nice touches of that era that gives off the nostalgia to the audience and add to the forensic evidence items such as mutilated body parts were haunting, unsettling as possible. Raya Martin’s directing commands the camera and, shooting the cast, the scenery in a candid way, letting them absorb every bit of the dialogue, the scene and be in that moment to express every single aspect of their roles from wide range of emotions and nuances against the gritty complex backdrop of 1997 Manila. Going to the climax has its shortcomings, culminating the arcs of the priests, NBI and the media has a brisk build up, setting the confrontation against the serial killer was interrupted with flashbacks explaining his motivations that tried to lose ends and halt that momentum the third act going but still remains a solid, powerful closure. Smaller and Smaller Circles’ deserves to be called a Filipino film; its themes and commitment in bringing a social commentary relevant to certain issues these days makes the film timeless and expresses every layer of the narrative in a filmmaking, the imagery of colorful, raw urban Filipino landscapes up to the local sensibilities, traditions and cultural sensibilities, its dynamics not to mention some jokes would make the audience relate to and its accessible to those who haven’t read the book like I do. Smaller and Smaller Circles opens in cinemas, December 6. Special thanks to Columbia Pictures Philippines and TBA Studios for the invite! Photo stills courtesy of TBA Studios. A passionate, enthusiastic writer, Mico Orda utilizes his filmmaking skills to keep his writer’s edge. He enjoys a lot of outdoor activities, which juice up his creative juices. REVIEW: Loving Vincent – The World’s First Oil Painted Feature Film!